Need an accurate reading of ambient temperature in your kitchen or other cooking area? This Taylor Precision 5380N 1 3/4" mini indoor/outdoor stick-on thermometer includes an adhesive mount to make placement simple and convenient. This mini thermometer features displays a temperature range from -40 degrees Fahrenheit to 120 degrees Fahrenheit so you always know just how hot your cooking space, dining room, or event area is getting. For maximum durability, it features weather resistant, rustproof construction. we bought these for our milk coolers. They work great because they fit very nicely on the side. i would recommend them to someone that is looking for thermometer. These are really inexpensive so I thought they would be great as a "tester" thermometer - so far so good! We have them inside our freezers as a secondary thermometer and they are perfect! These seem great so far. Easy to read, and very easy to mount. We use them in all of our coolers and prep stations. They are easily placed in a convenient spot to check on a daily basis. The Taylor Mini Window thermometer is a inexpensive and convenient little thermometer. Its large range makes it useful in a variety of scenarios including the kitchen, fridge, and freezer. The Taylor 5380N is a teeny tiny thermometer useful for small spaces. It seems relatively accurate, although given its size, it can't be too accurate as its simply too small to have markings of sufficient accuracy. I use it for pantry storage temperature monitoring. Throw it in the box you store bulk chocolate chips or spices or whatever. Its very much a unique niche thermometer given its size but its bargain priced so the worst that can happen is your out a couple bucks. I bought three of these, and all three read about 6 degrees low at room temperature. It's possible I received three defective thermometers, but Webstaurant was really helpful at refunding me for the defective products. Many other reviews that I read had very good luck with these, so hopefully it was just bad luck on my part. We appreciate your review, Anthony. We wish this Taylor 5380N 1 3/4 inch Mini Window Stick-On Indoor / Outdoor Thermometer would have worked out for you. Our Customer Solutions team is happy to help if you have any further questions. This is a great addition for my baking kitchen. It takes up no space and is accurate at showing the temperature. 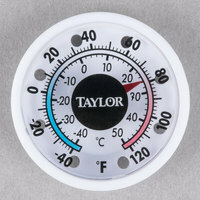 The Taylor Thermometer is easy to install and easy to read! Nice little indoor/outdoor thermometer with double-faced, pressure-sensitive abrasive tape for installation. Clear instructions offer a couple installation options. It can be taped on the back of the thermometer or the front face of the thermometer (like on a window so you can read outside temps from inside the window). Adhesive is precut for easy installation of either option. An awesome product, this Taylor Mini Window Stick-On Indoor/Outdoor Thermometer is super to have on every window for quick information. It measure 1.75 inches, and the temperature ranges from minus 40 to 120 degrees F. It also measures in Centigrade, and it stays put on glass window panes. This is a great thermometer, it’s small enough to be discrete but not so small that you can’t read it. It comes with a sticky pat for hanging. This mini thermometer is super easy to install and provides accurate temperature readings. I love how small it is – it's very inconspicuous and takes up hardly any surface area at all. Great little thermometer that can be used inside or outside. The double sided adhesive is strong and can stick to other surfaces besides windows. Temperature reading is accurate. The Taylor mini window stick on thermometer is great indoor or out door. It's small size makes it easy to put anywhere with out being an eyesore. Another thermometer we use often is this indoor outdoor window device. We like to keep the temperature in our kitchen consistent, especially when making baked goods. This thermometer will stick on to a window and we can always know what the temperature is inside our kitchen. Not only will this tell you the current temperature but you will also be able to save money on your heating and cooling bill by keeping the temperature consistent and never allowing it to get too hot or too cold. . The Taylor 1 3/4" Mini Window Stick-On Indoor/ Outdoor Thermometer that is space saving and inexpensive. It is very accurate in temperature readings and sticks easily to any wall. I recommend buying these in bulk and getting a baseline for each one before use. At room temp most (of 6 units) read between 78F and 80F degrees while 1 unit read 75F. So, overall they are very good thermometers for the price, but expect some variation. Best used for monitoring temperature differences, meaning, write down the usual reading for a particular location and then you will be able to monitor deviations in temperature by checking the 5380N. We are sorry your product arrived damaged, a Customer Solutions Representative will contact you about this shortly! Nifty little thermometer to use to see what the temp is outside but would also work inside! It attaches really quickly and adheres to the wall you place it on really fast so be sure you have it facing straight if you want to have it level. Easy to read and takes very little space. The Taylor 5380N 1 3/4" Mini Window Stick-On Indoor / Outdoor Thermometer works great. I checked the temperature and it is very accurate. Excellent product and price! A cute palm sized thermometer that does the job well. Works well to double check freezer temps and I would recommend for several needs for certain. Bought this to measure the temperature in my bathroom. It's perfect for this purpose. It's very accurate and easy to read. I would recommend this. Great temp reader, its nice to know the specific temp of rooms used, so you can see if thermostat is working properly, instead of having someone come. We just love this product from Taylor! It's so easy to mount ( design)! And the display is easy to read! We plan to place in the indoor setting! 5 stars! Perfect getting accurate readings everytime this Taylor 1 3/4" mini indoor/outdoor thermometer is a great purchase to have for any food vendors working out of a commissary. Really nice little thermometer for the price! Comes with double sided tape so you can quickly put it up. I use mine in my kitchen to make sure the air doesn't get too hot when I'm cooking. This thermometer is easy to read and provides accurate measurements. I use to test the temperature in my kitchen so it is easier to control rising times! This thermometer is extremely useful and small enough to fit just about anywhere. I purchased three of them and have one in the office, in the storage room and in the car. It has both C and F readings on it and despite its tiny size, it is very easy to read. On top of being adorable, it so so functional and you would be surprised how useful it is to have them wherever you are. Taylor products are dependable and you can't beat the functionality and price of this item! We got this because it was reasonable and we liked the size. I need to put my glasses on to read it, it is small. This is a simple and reliable thermometer at a very affordable price. It comes with double sided tape in the package and is very easy to stick it where you need it. We attached a magnet to the double sided tape and place this thermometer above bowls of dough to monitor their temperature while they rise. We did not want to get a big bulky thermometer for our kitchen. So when I found these on webstaurant, it fit what I was looking for exactly. Great price to have an accurate thermometer in the kitchen! The peel and stick is perfect with 2 different mounting options. Easy to read numbers! These are really handy for baking bread in a fluctuating climate. No matter what season, I use it to find a good place to proof rolls, cinnamon buns, or bread, and they have been accurate and reliable so far. This is a nice cheap and versatile thermometer. We use them for our food truck business, in our refridgerators and also have one in the truck. I love how small and easy this thermometer is to mount. You can really pop them just about anywhere for a quick and easy temp readout. I'm a fan. These thermometers are superior to the cooler hanging thermometers because of the adhesive. You will never be searching for thermometers that have fallen/ are lost during the health inspection. The read out is also clear and large for quick glancing at the temperature. I would suggest installing in a turned off cooler and using alcohol to clean the location first. Great thermometer - accurate. Just don't use the self adhesive option in an already cold refrigerated make line. We did and it didn't stick. Would still recommend it, though. Good buy! This indoor outdoor thermometer is great. I can tell what the temperature is with out having to go outside. It's great to have on hand.